When you’re involved in the inner workings and decision-making process surrounding a retail store, whether large or small, there are plenty of aspects to consider ensuring that your store is the best it possibly can be. Installing a custom sound system within your retail business is one such consideration. 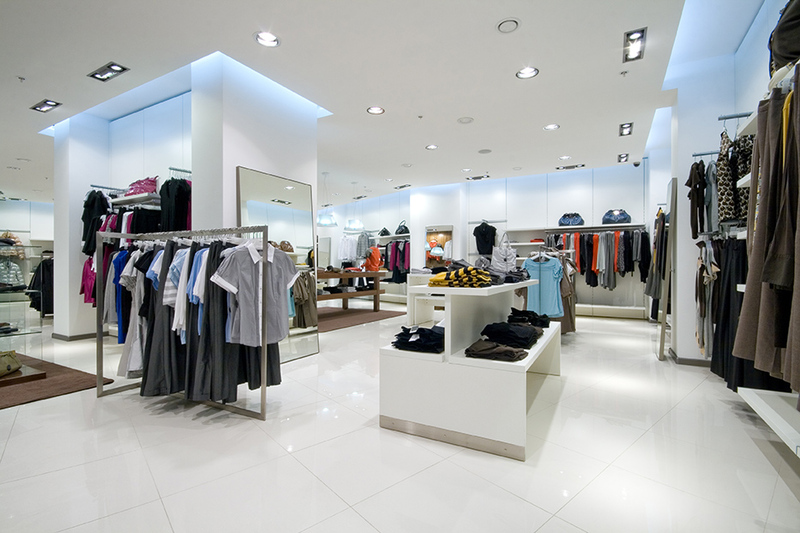 A retail store sound system offers many positive features for both large chains and small, privately-owned shops. From engaging customers with soothing background music throughout their shopping trip to providing an easy way to utilize intercom messaging, a sound system has many helpful uses. If you've been considering installing a retail store sound system and have yet to do so, the following considerations will guide you along the way and prove helpful for preparing you for this must-have store inclusion. When you have a retail store sound system playing background music throughout the day, this can provide a soothing shopping experience. When done correctly through the installation of a properly constructed sound system, such as one a commercial audio professional provides, the music offerings may be so subtle that customers don't even realize music is playing in the background. Alternatively, when you don't have music playing, the stillness and quiet atmosphere of the shop may in fact be too quiet for the customer and they’ll quickly realize that there’s no background music to enjoy. It may even be an awkward silence. PTG is a premier retail store sound system provider and knows what clients want regarding a sound system, as well as how thankful shop owners are to have a system working wonders for their business. “When music is down in our store, we see up to a 40% drop in sales,” states one of PTG's major retail customers. It’s important to have a fully-inclusive retail store sound system in place and in operation every day. Music in a retail setting is ideal for creating an overall mood and making shopping an enjoyable experience. The type of music you play in your store depends on your overall brand and the vibe you’re striving to achieve. For coffee shops, bookstores, lingerie shops, and other relaxing types of retail stores, instrumental music is ideal. If your shop is more kid-friendly or one with a teen focus, an upbeat and popular music style is preferable. 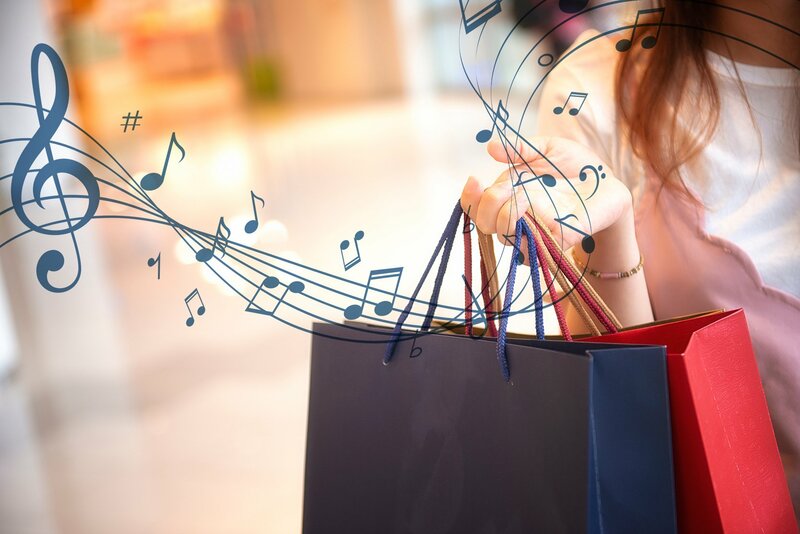 Whichever style of music you choose, consider your clientele and select the type of music they’d appreciate to ultimately keep them in the store longer, as well as encourage them to become returning customers. A research study from the 1980s showed that slower music resulted in customers shopping longer and taking their time, thereby providing them with the time to purchase more. Faster music, on the other hand, made customers walk faster and get in and out more quickly, which could mean less purchasing. Although this study is decades old, the concept is still highly relevant. Background mood music is so subtle that customers may not even realize it's on. However, they’re ultimately affected by the presence and style of music in their shopping ventures. When considering where to put your retail sound system speakers throughout the store, keep traffic flow and zoning in mind so that the placement is relevant to where your customers will spend most of the time in store. Look at the merchandise and choose a style of background music that will appeal to your customer base. You want the music selection to make it more likely for customers to enjoy the atmosphere and stay in your store longer. Music should be heard throughout the store, but especially in certain zones such as the entryway, dressing rooms, cashier area, and in specific merchandising areas. When you have your retail store sound system set up, make sure you have it situated in a place where only owners, managers, and other supervisory employees can access it. Access keys and inaccessible wires are also things to consider regarding the control system and its placement. A professional team will be well-versed in the multiple aspects surrounding retail store sound system setup and can help you select a location which works best in your retail store. You can get more tips here on how to choose the best AV installer, or what great service after the sales looks like. Once you have your retail store sound system in place, it's time to let the music play and draw your customers in. Prior to hooking up the sound system and letting the good times roll, be sure to consider all licensed music regulations and the legalities surrounding the use of music in a commercial setting. Licensing under copyright laws is required and you must do your due diligence to ensure that the music you play is legally permitted. Once you determine where you to place your retail store sound system, there are a few considerations pertaining to design. First, be sure to have the retail sound system set up in a location where there’s enough room for the system to grow and be upgraded should the need arise in the future. Secondly, it's important to note that a sound system is not only used to play music, although this is one of the main reasons to have one installed. Thirdly, the sound system can be equipped with a microphone and public announcement system, which is especially helpful in larger stores. The PA system can be used to page customers or announce flash sales going on. 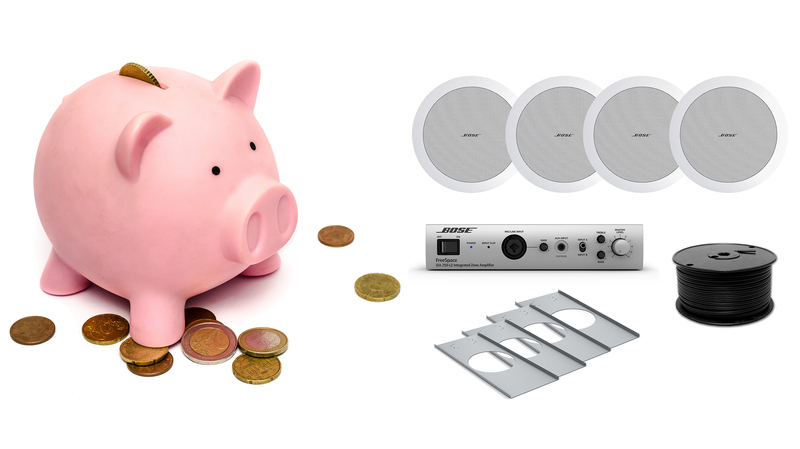 Having a sound system in your shop offers many wonderful benefits. Customers and employees will both enjoy the music and having delightful atmosphere may even get your clientele to stay longer and spend more money in the long run. With a state-of-the-art sound system installed, your retail business will be even better than before. The PTG team creates, installs, and services commercial audio experiences that build customer engagement for your business no matter the setting. Contact us today at 248-668-3100 – we’re ready when you are.